It is to be remembered here that Archbishop Demetrios refused to live in the home of the late Archbishop Iakovos, located in well-to-do Rye, NY, stating the commute was too lengthy to the Archdiocese in Manhattan. At the March 3 local Congress, Demetrios also said that his parents left their family home to his brother and him, but he sold his portion and used the money to provide scholarships to students. He also said he doesn’t own a car, though it is common knowledge that the Archdiocese provides him with a deluxe-feature Audi, and two deacons drive him around. 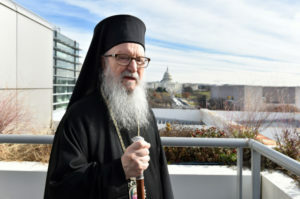 That’s cute – Archbishop Demetrios has no home … isn’t he the one with a red velvet throne & gets chauffeur driven everywhere & gave Talk at Trump’s Inauguration but didn’t even mention his Orthodox faith Or Jesus name? But Evangelical Paula White did? !